Adding images to your articles encourages people to read them, and well-chosen images can also back up your message and get you a good ranking in image search results. But you should always remember to give your images good alt attributes: alt text strengthens the message of your articles with search engine spiders and improves the accessibility of your website. 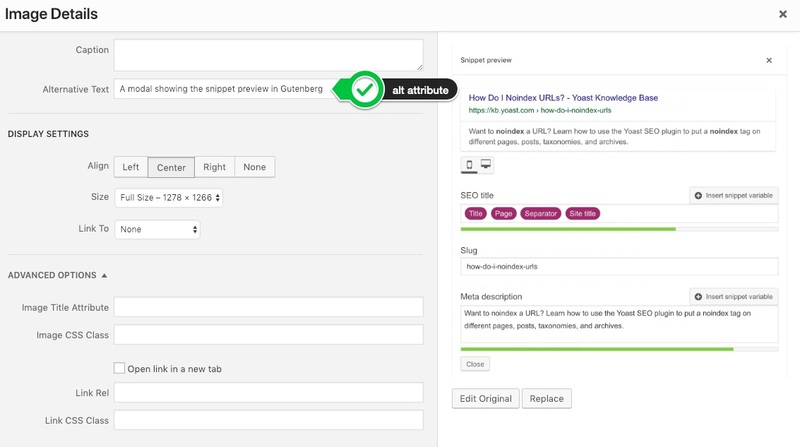 This article explains all about alt tags and title tags and why you should optimize them. Note: the term “alt tag” is a commonly used abbreviation of what’s actually an alt attribute on an img tag. The alt tag of any image on your site should describe what’s on it. Screen readers for the blind and visually impaired will read out this text and therefore make your image accessible. What are alt tags and title tags? The alt tag is used by screen readers, which are browsers used by blind and visually impaired people, to tell them what is on the image. The title attribute is shown as a tooltip when you hover over the element, so in the case of an image button, the image title could contain an extra call-to-action, like “Buy product X now for $19!”, although this is not a best practice. Each image should have an alt text, not just for SEO purposes but also because blind and visually impaired people won’t otherwise know what the image is about, but a title attribute is not required. What’s more, most of the time it doesn’t make sense to add it. They are only available to mouse (or other pointing devices) users and the only one case where the title attribute is required for accessibility is on <iframe> and <frame> tags. If the information conveyed by the title attribute is relevant, consider making it available somewhere else, in plain text and if it’s not relevant, consider removing the title attribute entirely. But what if an image doesn’t have a purpose? The empty alt attribute makes sure that screen readers skip over the image. Google’s article about images has a heading “Use descriptive alt text”. This is no coincidence because Google places a relatively high value on alt text to determine not only what is on the image but also how it relates to the surrounding text. This is why, in our Yoast SEO content analysis, we have a feature that specifically checks that you have at least one image with an alt tag that contains your focus keyphrase. When choosing alt text, focus on creating useful, information-rich content that uses keywords appropriately and is in context of the content of the page. Avoid filling alt attributes with keywords (keyword stuffing) as it results in a negative user experience and may cause your site to be seen as spam. If your image is of a specific product, include both the full product name and the product ID in the alt tag so that it can be more easily found. In general: if a keyphrase could be useful for finding something that is on the image, include it in the alt tag if you can. Also, don’t forget to change the image file name to be something actually describing what’s on it. When you upload an image to WordPress, you can set a title and an alt attribute. By default, it uses the image filename in the title attribute, which, if you don’t enter an alt attribute, it copies to the alt attribute. While this is better than writing nothing, it’s pretty poor practice. You really need to take the time to craft a proper alt text for every image you add to a post — users and search engines will thank you for it. The interface makes it easy: click an image, hit the edit button, and you’ll see this: There’s no excuse for not doing this right, other than laziness. Your (image) SEO will truly benefit if you get these tiny details right. Visually challenged users will also like you all the more for it. Read more about image SEO? We have a very popular (and longer) article about Image SEO. That post goes into a ton of different ways to optimize images but is relatively lacking in detail when it comes to alt and title tags — think of this as an add-on to that article. I recommend reading it when you’re done here. The post Image SEO: alt tag and title tag optimization appeared first on Yoast.